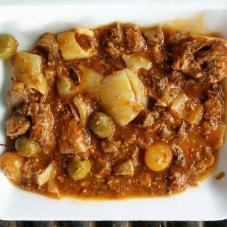 Gandinga De Cerdo (Pork Liver, Kidney, and Heart Stew) - Tienditadepuertorico.com - Buy Puertorican Food Here!! Pour lime or orange juice over meat. Let sit 15 minutes and then drain. Lightly season meat with salt and pepper or adobo. Heat achiote oil over high heat in large cooking pot. Add ham and stirfry for 3 minutes constantly stirring. Add all remaining ingredients minus potato, pork liver, kidneys, and heart. Cook 5 minutes stirring frequently. Taste for salt and reseason if necessary. Stir in potato, liver, kidneys, and heart. Cover pot and cook 45 minutes or until meat is tender and sauce has thickened.